Nose: A bit restraint, almost shy at first. Aromatic with mild but growing smoke. Gentle coastal campfire. Nice balanced spice blend including fresh herbs (basil, cilantro) combined with ginger and black pepper. Slight citrus note of lemon combined with anise. Taste: Also restraint, starting a bit fresh with the citrus and anise and then it hits you. Quite strong smoke, but still the coastal campfire, but now combined with grilled salmon and smoked mackerel, even a bit oyster. A bit buttery and oily. Finish: Does it ever stop…. It is long and pungent. Bit peppery and somewhat burnt nuts, but very smoky and peaty. 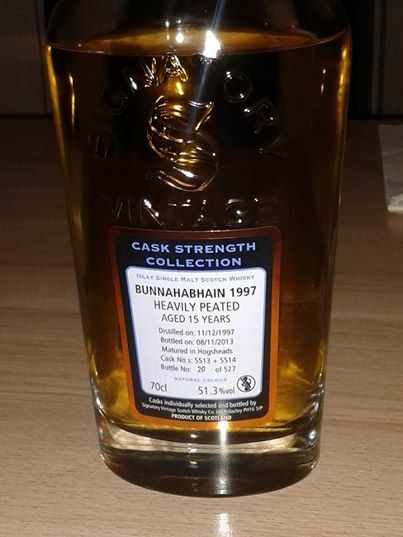 Now I know why this is called heavily peated. Nose: Outgoing, but again a lighter, fresher type of smoke at first. Very similar to the previous one, but a tad sweeter, with vanilla and liquorice. Hints of citrus fruits, red grapefruit and orange. Again the ginger and the black pepper are present, but the fresh herbs are absent. Taste: starts sweeter, darker with quite a bit of oaky influence, lots of roasted nuts and grilled meat with a spicy bbq rub with cloves, cinnamon. Also a strange note, bit vinegar like but it isn’t that I guess. Casks feel much more charred then with the previous one. Finish: Again very long, but also quite a bit of tannins which leaves a bitter tone pushing the smoke and peat backwards. Feels less peated than the previous one. Jeroen, Thank you for the sample and looking forward to your notes! 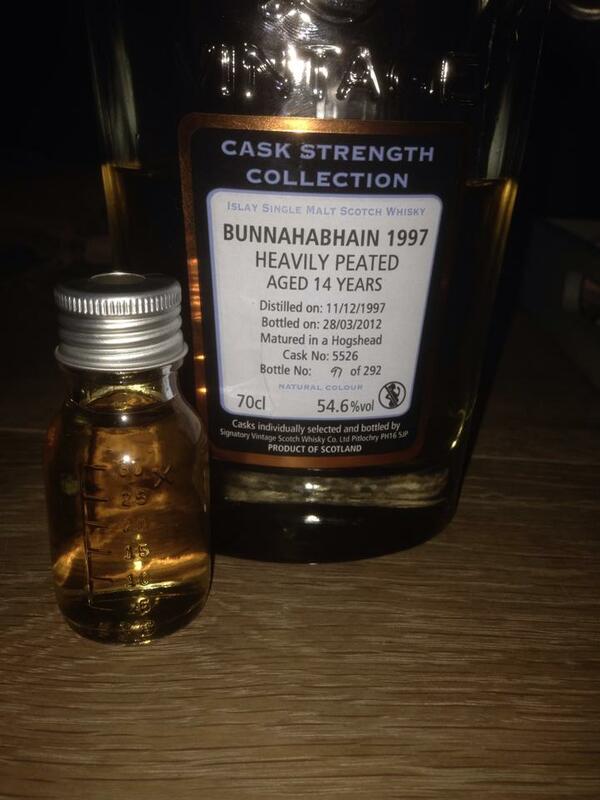 This entry was posted in Bunnahabhain, Islay notes and tagged 1997, 55 ppm, Bunnahabhain, Bunnahabhain 1997 heavily peated, Heavily peated, Islay, Peat, review, Signatory, Signatory VIntage, Smoke, Vintage, Vintage 1997, whisky. Bookmark the permalink.